Wolf Kahn, whose lyrical and beautiful landscapes are among America’s best-loved contemporary paintings, has traveled extensively throughout his life. In this exquisite book, he describes a number of his journeys in the United States, illustrating his adventures with the paintings and pastels that he made along the way. As he recalls these art pilgrimages, he describes the people he has met, and the sights he has seen, and discusses choosing a location to paint and what he hopes to accomplish in his work. Thus, he brings the reader into his own creative life. 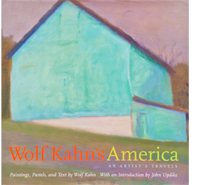 Splendidly illustrated with Kahn’s paintings, drawings, and pastels, Wolf Kahn’s America: An Artist’s Travels is an insightful look at the world through the candid and unpretentious eyes of one of America’s finest colorists. John Updike’s introduction provides a sparkling addition to a most engaging book. Wolf Kahn’s America: an artist’s travels/ paintings, pastels, and text by Wolf Kahn; introduction by John Updike. 1. Kahn, Wolf, 1927 – Journeys – United States. 2. Artists – United States – Biography. 3. United States – In art. I. Title.